4th of July tyvek wristbands are bright and patriotic. 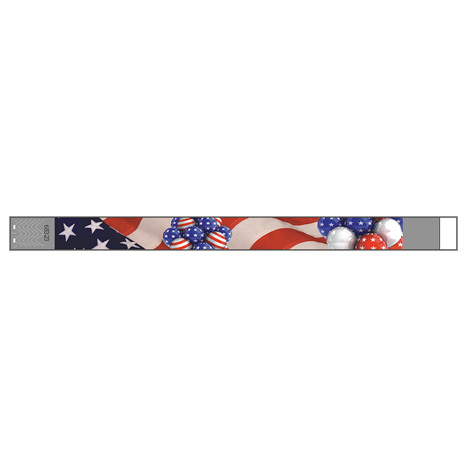 Each wristband depicts images that resonate with patriotism. Brilliant full color printing makes this unique pattern one of our best sellers. 3/4" x 10" tyvek. Tyvek paper wristbands have tamper proof security slits backed by an aggressive adhesive that shreds the security slits when someone tries to peel back the end. They come sequentially numbered in the box of 500, which allows for crowd control and a way to reconcile your till. This colorful wristband is an excellent choice for the 4th of July, or any occasion. 1 Quantity = 500 wristbands. For larger quantities, please call 253 841 4057 for a quantity discount. Thank you for shopping Wristband World.